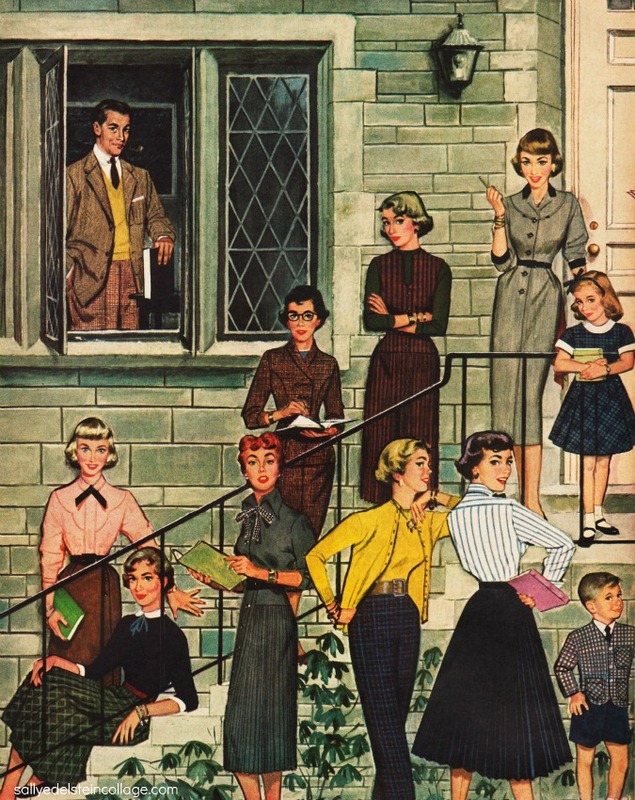 The graduating class of 1960 was forever enshrined in the vintage illustration on the right that appeared on the cover of the Saturday Evening Post in Sept. 1960. Depicting Smith College graduation the accompanying commentary points out that marriage is likely in the future to these smart young cover misses. June is the month-long associated with graduates and brides and it wasn’t that long ago that they were often one and the same thing. If author Susan Patton has her way, female graduates would do well to follow that same course. The controversial “Princeton Mom” has returned with a new book Marry Smart: Advice for finding THE ONE a rehash of the same old fairy tale girls have been told for generations: that it s more productive to devote energy to husband hunting than focusing on their careers. This advise is as antiquated as the notion once held that girls went to college to get their MRS degree. Once upon a time, most young women in the 1950’s and early 1960’s were convinced that the basic occupation of virtually every girl was choosing a man to marry, and college courses were set up to help Betty Coed in her mission to snaring a proper mate. In the spring of 1956, my Aunt Rhonda was a college senior searching for Love and Marriage. Convinced that the basic occupation of virtually every girl was choosing a man to marry, a smart cookie had a keen sense of her market value: her looks, personality and virginity. Which College Senior Will You Be Watching on Graduation Day? Pretty and popular, Rhonda was voted the college senior with the likeliest future for matrimony. It would be 7 long years before Betty Friedan wrote about a problem that had no name, and another 10 before the founding of National Organization of Women. Vintage fashion ads featuring college girls offer some helpful hints. 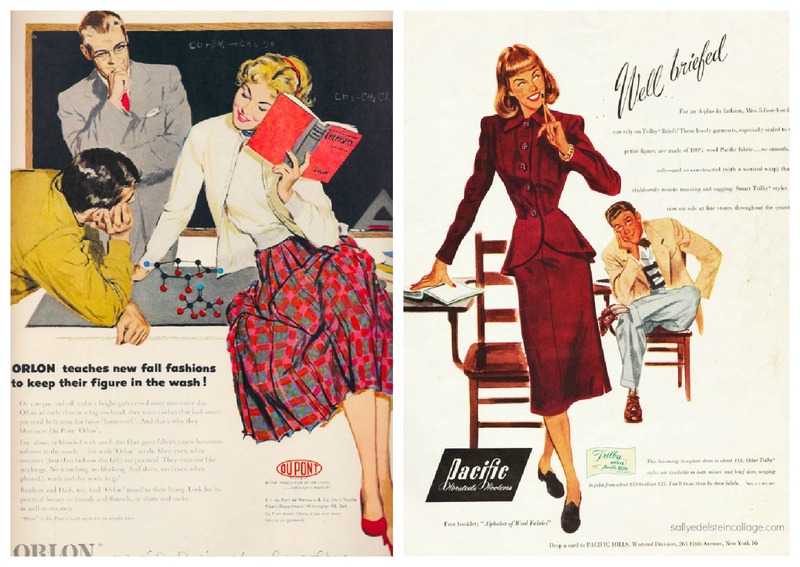 The ad on the left with the comely co-ed wowing her profs is for Orlon Fabric “which teaches new fall fashions to keep their figure in the wash.” The ad on the right for Pacific Fabrics with the headline “Well briefed” promises an A+ in fashion for the Miss 5’4″ or less, and judging by the ogling male student she’s scored a good grade. One of the first National Merit Scholarship winners, Rhonda knew brains were not enough and in fact could prove a booby trap without that right shade of lipstick and that perfectly turned out casserole. On the ball, she enrolled in the newly developed Marriage Arts Dept. of Syracuse University, which promised to help her with her makeover from a Brain from Main to a regular girl. It was a far cry from today’s women’s study curriculum but they did offer clever, useful courses such as house planning and family living, providing her with useful training designed to mold an attractive coed into an ideal wife, enhancing her marital resume. Only a few years earlier in a speech to business and professional women the Dean of Women at Syracuse University announced that feminism was outdated. Luckily, Rhonda thought with a shudder, women had passed through that stage. 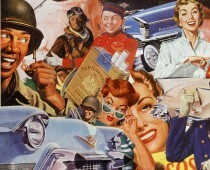 Home Economic classes emphasized Man pleasing menus. In this way it was a very important factor in your husbands career. “Men especially, are very shrewd at judging other men by the women they marry and the homes those women run,” she told the class somberly. There were informative courses in vital matters like decorating, shopping and clothes selection. and the all important grooming clinics taught by Madam Yvonne trained at the Helena Institute de Beaute in Paris. Unlike the matronly Miss Higgins, Madame Yvonne was the epitome of chic and with her swirling feminine dress 12 inches from the floor, tiny waist and pointed bosom the picture of French chic that was revolutionizing fashion. By the end of the semester, Rhonda’s brain was tuckered out with all this date-data. As graduation neared, Rhonda was growing concerned as there was no engagement ring in sight. She bemoaned her predicament-“I’m sick of playing solitaire…I want to wear one”. What with those pesky Russians building their arsenal of nuclear weapons and President Eisenhower sending boys all over the globe, there was no telling how many eligible men would be around. The government put out a pamphlet called “You can Survive” to help with those Nuclear Bomb Jitters. Sure Rhonda thought, she could survive all right, but not as a spinster, thank you! With her newly sheered bangs to hide her intellectual forehead, her “beau-catching” curls caught the eye of a dreamy senior and it was not long before she was calling him her fiancé. Her hard work had paid off handsomely, as she accepted both the diploma and her glittering ring. That degree in Sociology would end up tucked away safely in her Lane Cedar Hope Chest along with all her cherished keepsakes. Her real work was about to begin. The traditional musical accompaniment to a bride’s recessional isn’t from anything written by Handel. The traditional recessional (exit of the bridal couple) music, known popularly as the “Wedding March,” was written by Felix Mendelssohn. “Felix Mendelssohn’s “Wedding March” in C major, written in 1842, is one of the best known of the pieces from his suite of incidental music (Op. 61) to Shakespeare’s play “A Midsummer Night’s Dream.” It is one of the most frequently used wedding marches, generally being played on a church pipe organ. Good catch. Funny I know it is Mendelssohn, until someone else corrected me and I erroneously listened to them.